The Price Center serves as the research partner for Lift to Rise, a collective impact initiative working to build a future where all Coachella Valley families are healthy, stable and thriving. Too many Coachella Valley residents face desperate conditions, with nearly half of residents living below 200% of the federal poverty line. Lift To Rise, in partnership with the Price Center, employs a collective impact model to change the trajectory of what it means to grow up, live, and work in the Coachella Valley. As the research partner for Lift to Rise, the Price Center helps assess community needs, develops and tests community interventions, and evaluates the overarching impact and effectiveness of the collaborative’s work. 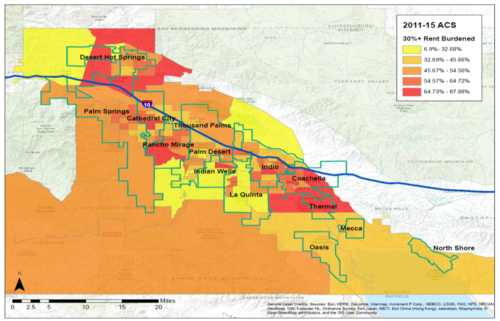 This research provides valuable, nuanced insight into the multiplicity of vulnerabilities, barriers, and challenges that residents face in the Coachella Valley. Developed a new iteration of the Neighborhood Data for Social Change platform tailored for the Coachella Valley. The web portal provides local residents with high-quality and policy-relevant neighborhood-level data to inform policymaking and help build a rich, authentic, and evidence-based narrative of life in Coachella Valley. Click here to enter the platform! Through this work in the Coachella Valley, the Price Center and Lift To Rise are developing and testing a new social innovation framework built on an iterative process of concurrent design, implementation, and evaluation of pilot programs and other test strategies. This flexible, responsive approach to community impact work offers a valuable alternative to traditional models of sequential program design and evaluation, which are often insufficient in the context of a dynamic policy environment. For more information about the Lift To Rise mission and their activities, visit the Lift to Rise website.